The last decade has seen a significant growth in the output of scholarship related to the problematic nature of the American criminal justice system. Experts have doggedly pursued answers to questions that have baffled many: Why do we lock so many of our citizens up? And what can we do to stop it? What has emerged in much of the literature is what Fordham Law School professor John Pfaff refers to as the "standard story." According to this analysis, mass incarceration is driven by high numbers of low-level drug offenders, longer sentences, and the development of the prison industrial complex. Because the standard story tends to be widely accepted, reforms to the criminal justice system often start with these ideas in mind. In his new book, Locked In: The True Causes of Mass Incarceration and How to Achieve Real Reform, Pfaff fires a shot across the bow of the standard story. Analyzing reams of data, Pfaff systematically challenges almost everything we thought we knew about mass incarceration. Along the way, he proposes his own take on the causes of the national catastrophe that is mass incarceration. He also suggests why much of the current reform work being done will fail, and discusses what will work. A key assumption of the standard story is that huge increases in the incarceration of low-level drug offenders have driven up incarceration numbers. This is accepted virtually as fact, all the way up to the former president, Barack Obama. Obama's efforts to use his clemency power to address over-incarceration were limited almost exclusively to low-level, nonviolent drug offenders. But Pfaff provides eye-opening data that challenges this core assumption. In the state prison systems, where the large majority of America's prison population resides, only 16 percent of the population is serving time on drug charges. And less than six percent of those prisoners are both low-level and nonviolent drug offenders. The reality is that more than half of state inmates are imprisoned for violent crimes. Additionally, almost two-thirds of the growth in such prisons since 1990 has resulted from the incarceration of violent criminals. Low-level, nonviolent drug offenders have not driven the spike in American prison populations. Neither has the increasing use of longer sentences, another core assumption of the standard story. Pfaff argues that rising, short-term admissions are what has driven up populations, not longer sentences. Cutting time would reduce the prison population, but Pfaff acknowledges that this would not be politically expedient, and perhaps more importantly, it would not reduce the number of people passing through prisons. The standard story also tends to lay the blame for mass incarceration on the development of the prison industrial complex. The argument is that injecting a profit-seeking private industry into the prison setting leads to problems. For one, doing so leads to deteriorating prison conditions and greater violence. Additionally, private industry involved in the prison industrial complex has a morally repugnant and pervasive incentive to increase the amount of people who are imprisoned. Pfaff argues that private industry plays a very small role in the American criminal justice behemoth. Perhaps more importantly, public sector groups, such as correctional unions, have the same incentives as private industry, and they are arguably much more powerful. While it is "emotionally salient," according to Pfaff, to focus on profiting off of the suffering of prisoners, the issue is marginally important. There is much room to disagree with Pfaff's conclusions as to the importance of private industry in the correctional setting, however. Turning to what actually is causing the mass incarceration problem, Pfaff observes that "[i]t is impossible to understand what reforms make sense without first understanding what we know—and, even more importantly, do not know—about what causes crime to rise and fall." A greater understanding here leads to a greater understanding of why mass incarceration remains a problem in this country. Pfaff starts with a significant player in the criminal justice system, one routinely overlooked when examining the cause of mass incarceration: the prosecutor. Reformers, as a rule, fail to understand the power of the prosecutor. Between the completely autonomous and unreviewable decision on what charges to bring and the ability to engage in unfettered plea bargaining on an uneven playing field, prosecutors are potent forces in the criminal justice process. Moreover, prosecutors are what Pfaff refers to as "black boxes." There is little to no data available through which scholars and the public may understand why or how a prosecutor does anything. Prosecutors also have a 95 percent reelection rate, and are almost always unopposed when up for reelection. In addition to having full authority to charge how they want and to obtain whatever sentence they want, prosecutors do not have purse strings attached to their decisions. In almost every case, prosecutors are funded by counties, but imprisonment is paid for by the state. Pfaff also argues that the politics of punishment are a significant factor influencing mass incarceration. America is a punitive state, and politics are often driven by fear rather than rationality. The weight given to the benefit of safety—often illusory safety—far outweighs the weight given to the costs, economic and otherwise, of massive incarceration. Being perceived as soft on crime is often politically deadly, and this leads to policy and action that drives up incarceration. Finally, Pfaff turns to the elephant in the room: violent crime, and how we deal with it. Most longer sentences are for violent crimes. The majority of people in prison are in for violent crimes. In Pfaff's analysis, it will not do to try to lay the blame for mass incarceration on over-imprisonment of nonviolent crimes, because the data does not support this conclusion. And we must understand the reasons why this is so. Longer sentences for violent crimes are often defended as necessary to incapacitate bad actors, as well as to deter future crime. But the data does not support the value of either incapacitation or deterrence. Statistics clearly show that people age out of crime, making incapacitation unnecessary and wasteful. And studies have shown again and again that longer sentences have little to no impact on the deterrence of violent crime. Pfaff offers potential solutions to the true causes of mass incarceration as he sees them. First and foremost, the prosecutor must be regulated, public defender services must be better funded, and the financial moral hazards involved in prosecutorial decisions must be addressed. Secondly, political defects leading to mass incarceration should be remedied by moving to an appointment system (as opposed to an electorate system) for prosecutors and by getting out the vote to remove overzealous prosecutors. Finally, sentences for violent crimes should be slowly scaled back, early releases of violent offenders should be slowly scaled up, and reform efforts should be better framed to emphasize the need to deal with violent criminals. 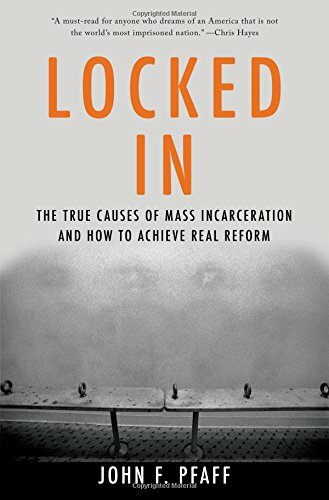 Locked In is a refreshing look at the causes of mass incarceration, and is a must-read for anyone involved in the criminal justice reform movement. You may not agree with everything that Pfaff argues, but you will finish the book with a better understanding of the complexity of the problem and the need for solutions. As Pfaff succinctly states, "Incarceration can be thought of like chemotherapy or radiation therapy: it targets a disease, but in a blunt way that causes a lot of collateral damage and if not properly calibrated it can do more harm than good."